At Oak Ride Farm we have been really pleased with the interest we have had for all the new services we can offer our clients. Most recently, of course, was the grooming parlor that opened in April. This smart purpose built parlor sits alongside our hydrotherapy facility. Nanette runs the grooming service and she has had a wide variety of dogs in already, being a mix of clients coming from the boarding kennels and others just visiting for grooming. Why not have a look at our website Gallery for grooming pictures, as well as our other happy kennel/cattery/hydro guests. Apologies that we had to close the hydrotherapy for a couple of days this week to allow the guys to attend The Vet Festival at Loseley Park. This is an amazing opportunity to mix with numerous pet professionals, and learn so much about all that’s new in the veterinary arena, and associated pet health industry. Noel Fitzpatrick hosts this event, and there are many speakers on a variety of specialised areas to choose to visit. Our team always comes back with lots of useful information to support our hydrotherapy clients. The kennels and cattery have been very busy particularly over the half term and if your pet has been with us, why not check out our Instagram account and see if they are there? Which reminds me, just so we are on the side of compliance with the new data regulations, clients will be asked to indicate their consent (or not) for marketing communications when they next visit us please. Has anyone spotted the new additions at Oak Ride Farm? 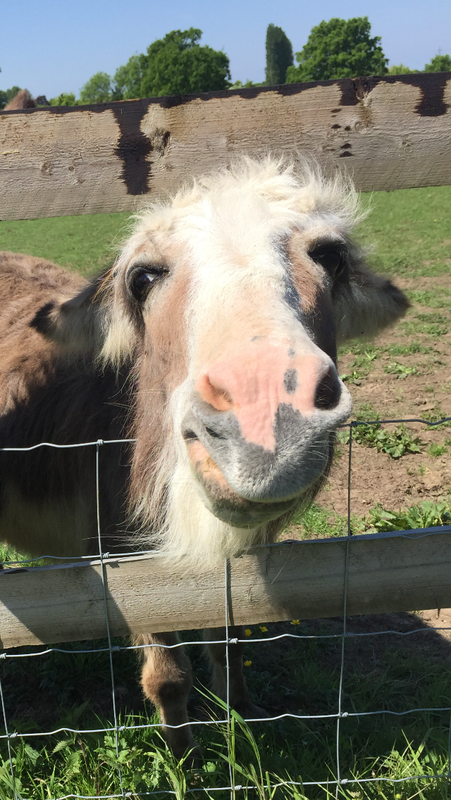 When you are next in, just take a look over to the paddocks and see the antics of the donkeys!